In the heart of the plains of Roussillon, come enjoy this sunny Catalan region in the warm and comfortable atmosphere of a renovated hotel. 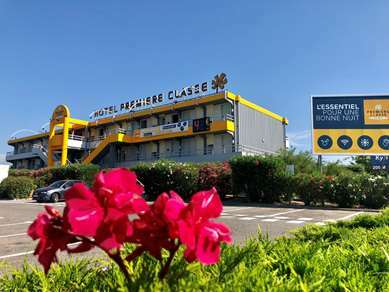 Hotel Kyriad Perpignan-Nord is ideally located at exit 41 off highway A9, 10 minutes from the historic city center of Perpignan and 5 minutes from Perpignan-Rivesaltes Airport. Between the coastal resorts and ski resorts, the treasures of Catalonia await you. Come support the Catalan Dragons at Aimé Giral and Gilbert Brutus stadiums. Take advantage of your stay to visit Canigou, the sacred mountain of the Catalans. The most beautiful villages of France are in your reach: Eus, high on its sunny perch, Castelnou, a Medieval village and Villefranche-de-Conflent, with its exceptional architectural heritage. Spain and Andorra await you for your shopping tours. 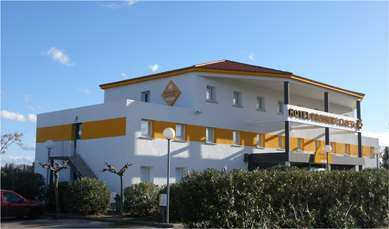 The Claira-Rivesaltes economic center is just a half a mile from the hotel. The Polygone shopping area is less than 5 minutes away. The Porte d'Espagne shopping area is 7 and a half miles away, and Mas Guérido de Cabestany, is 7 miles away. You have plenty to choose from for your activities, within just a few minutes trip by car: go-karting, canyoning, 18 hole golf course, thalassotearapie, sailing, sea fishing, diving, pedal boating, jet skiing, water skiing, boat trips, discotheques, horse riding, paragliding, ULM… and many more activities. You can also take advantage of our exclusive Wi-Fi+ service: a free high speed broadband connection throughout the hotel where you can freely surf, chat and watch videos. All rooms at our establishment have been renovated in a cozy, warm and contemporary style. We offer configurations with a double bed, two separate single beds, two specially adapted rooms for people with reduced mobility. All rooms have a private bathroom, shower and toilet. 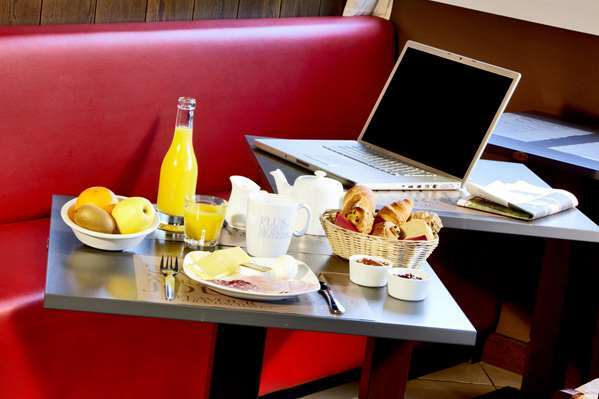 Your room is air conditioned and features a desk with phone where you can work in peace, and a 32 in. flat-screen TV with the main satellite and Canal+ channels. You also have free unlimited Wi-Fi. A courtesy tray with kettle, coffee, cookies and bottled water is offered upon your arrival and throughout your stay. We do not have a meeting room; however, our large area in the lobby where you can meet with your clients. Room no Ten was offered, but we asked for a different room, because of the unpleasant heavy smell of tobacco smoke. We were then offered room Twenty, this did not smell of smoke, but was tired looking, and the carpet was soiled. In the morning, the corridor again smelled of heavily of Tobacco smoke. What is the policy of Kyriad Hotels regarding smoking in public places?? There were some cold rashers of bacon on offer only a small amount (again I deliberate over what was called bacon) sitting in a puddle of water, and scrambled eggs which I had the last serving of. Other guests coming in for breakfast had no choice of cooked breakfast...nothing left and nothing forthcoming. There was the usual pastries,cold ham and cheese again not a huge amount. Overall this hotel needs a complete refurbishment, as for value for money the total bill was 68euros which for B&B was a scandal...I wouldn't advise anyone to use this hotel as there are many more in the vicinity which I'm sure would give a better experience for a traveller who only wants an overnight stop including breakfast somewhere that is clean and good value for money. We apologize for the problems in our hotel. Although we had paid 16 euros extra to be accommodated with our two cats, our room and en suite was rather cramped and small. 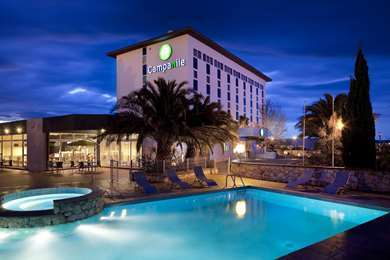 The bed was comfy and the hotel clean, reception was friendly and efficient and there is a grill restaurant next door. Your will be welcome to your next stay. A very average, and pretty careworn, chain hotel. 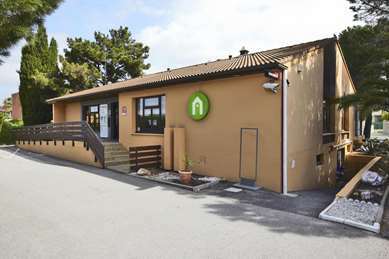 Extremely convenient for the motorway with plenty free parking which is gated and locked overnight. Comfortable beds. Decent adjacent restaurant was one of the reasons I stayed there, saves going too far to eat. First of all do not depend on your sat nav if its a tom tom to find this hotel, it will take you to the wrong location. Take the exit for the centre commercial and you will see the hotel from there. We spent over an hour roaming around Perpignan as with the post code provided our sat nav took us to Rivesaltes, which was miles away from the hotel. We got a good price for this room, so can't complain. The room was very small but had tea & coffee making facilities which is a big plus as far as I am concerned. Shower room needs a bit of a upkeep. No restaurant in hotel so had to eat in the Courtepaille which is attached, which is ok if you are a beef eater, not much else to choose from. We were not informed of any other restaurant to eat in but was given a discount voucher for the Courtepaille. Breakfast included bacon & scrambled eggs,and a selection of bread & croissants, but very small amounts were available so if you wanted another slice of bacon/bread or more egg you had to ask the waitress who would go and bring out 1 more portion of eggs, or a croissant or a about 1/6th of a baguette, felt she should have at least kept the stock full, but as I said previously it was better than just bread and jam. The internet was available & I could get emails but not much else, kept getting site not available messages. TV's old & small so no usb connections, consequently could not watch a film from a usb stick. Car park was secure, which is a plus. Right next to shopping centre another plus.. Would I stay there again yes if the price was good.